We tend to celebrate the top team’s accomplishments at this time of year, but let’s shift our attention to a certain individual’s triumphs who has gone above and beyond for his teammates and footy club. Although he couldn’t play on the field, Tom Campbell was a key player in helping to assist his team to achieve success throughout the 2018 season. 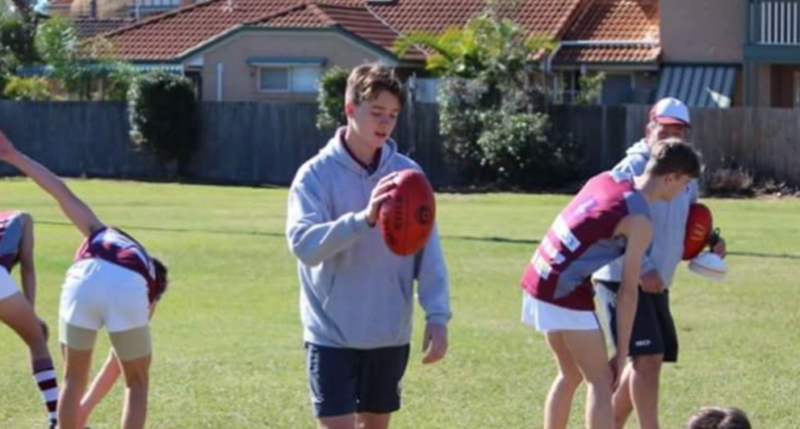 The remarkable youngster has overcome the disappointment of not being able to play football by becoming enthusiastically involved in the West Maroons Under 16s coaching group. Tom’s world was turned upside down on July 30th, 2017, when he was involved in a heavy tackle that left him with several serious injuries. After being hospitalised and consulting several neurosurgeons, Tom was advised to never play contact sport again. Despite the shocking news, Toms love for the game outshined the reality of not being able to lace up the boots with his team anymore. Not wanting to give the game away in its entirety, Tom has remained an active member in the Under 16s team and has also volunteered his time as the under 10s assistant coach. “TC (as he is most commonly known as) never misses an under 16s game and still trains alongside his fellow team mates each week,” coach Greg Curtis told aflq.com.au. “Whether it be leading the boys in their pre-game warm up or taking on the role as game statistician during the match, TC is always prepared to assist in any department,” said Curtis. When analysing stoppages, inside 50’s and tackles, and recording complex data for the coaches, Tom is always accurate and engaged in the game. “This remarkable young man radiates positivity throughout the club and has never once pulled the ‘why me’ card,” Club Manager Liz Guy said. The progression of his team is the result of Toms hard work, football skills and optimistic attitude. “The Under 16 squad thank him for his efforts, the 2018 junior football season wouldn’t have been the same without Tom.” said Curtis. With future aspirations as a coach and mentor on the horizon, “Tom will always be supported in his endeavours and encouraged to continue to develop in these roles,” said Curtis. Whether the support be from his mates, family or club, Tom must be acknowledged for his continued involvement and participation in the game he loves.